Agnar and Geirroð, the young sons of King Hrauðung, were out fishing when the wind blew their boat out to sea. In the dark, their boat was blown ashore and wrecked. A farmer and his wife found them and took them in for the winter. The following spring, the farmer gave the boys a boat in which to make their way back home. As the boys prepared to leave, the farmer spoke privately to Geirroð. A breeze sprung up and carried the boys to their home harbor. Geirroð, who was forward in the boat, jumped ashore and pushed the boat back out, saying to his brother, "Go where the trolls will take you!" The boat and Agnar were carried out to sea. Geirroð went up to the hall and was greeted joyfully. His father had died, and Geirroð was taken as king. Óðin and his wife, Frigg, were sitting on the high seat Hliðskjálf, looking out at all the worlds. Óðin said, "Do you see your foster-son, Agnar? He is raising children with a giantess in a cave. But Geirroð, my foster-son, is king." Frigg said, "But he is so stingy with food that he tortures guests if he thinks that too many have come." Óðin decried such a great slander and made a wager with Frigg that the story was false. Frigg sent her handmaiden to Geirroð with the message that a wizard was arriving in the country to bewitch him. Meanwhile, Óðin traveled to Geirroð's land, covered in a dark cloak, and calling himself Grímnir. Grímnir was brought before Geirroð and questioned, but Grímnir refused to say anything. 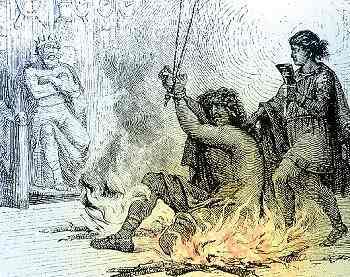 To force Grímnir to speak, Geirroð had two roaring fires built, and bound Grímnir between the fires. 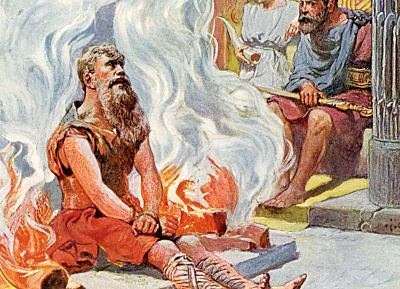 For nine days, Grímnir sat roasting between the fires, so scorched that his cloak burned off of him. Geirroð's young son, who was called Agnar, after the king's brother, realized that the king was acting wrongly towards his guest. Agnar went to Grímnir between the fires with a horn full of drink. Grímnir thanked the boy, saying "For one drink, you shall never get a better reward." Grímnir prophesied that Agnar would soon sit on the throne. Grímnir then showed his range of knowledge to the boy, describing details of the lives and lands of the gods and other supernatural beings. Any one paying attention would have realized that only Óðin would have known all these things. Grímnir finished by saying to Geirroð, "Now you may see Óðin, approach me if you can!" Geirroð sat with his sword in his lap. When he realized that his visitor was Óðin, he stood, to pull his guest away from the fire. But his sword slipped from his hand, hilt downward. The king lost his footing and fell forward. The sword skewered him, and he was killed. Óðin disappeared, and Agnar became king and ruled for a long time afterward. Few accusations were as insulting to a Norseman as to suggest that one was inhospitable to one's guests. Thus, Frigg's accusation of Geirroð's stinginess was a deep affront to Óðin. This story exists only as the narrative "bookends" for the eddic poem Grímnismál and is probably a more recent invention, rather than being an ancient story.